World Mercury Project note: When it comes to aluminum and mercury, one plus one does not equal two. The toxicity of mercury alone, and the toxicity of aluminum alone—both of which are concerning enough—are each far below the toxicity that results from exposure to both. Tests of the two metals in combination show that the toxicity levels skyrocket. How long have regulators known this fact? Aluminum and mercury are two of the most prevalent heavy metals to which humans are exposed, whether via food and food additives, drinking water, occupational and environmental exposures or from medical-dental products such as vaccines and amalgam fillings. A variety of recent studies have focused on aluminum overload prenatally and perinatally. Nowhere is the overexposure to aluminum more apparent than in childhood vaccines. 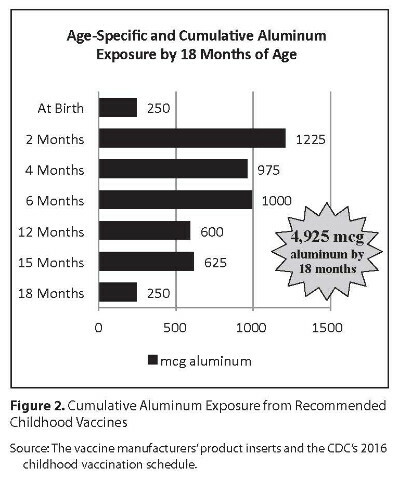 A two-month-old infant may receive up 1,225 micrograms of aluminum from the adjuvants in vaccines at a single well-baby appointment and a cumulative 4,925 micrograms by 18 months of age—astronomical levels that have never been assessed for safety. Given that neurotoxicity is already a major concern for aluminum and mercury when considered on their own, what happens when a developing fetus or infant incurs exposure to both together? Government regulators are well aware of these facts. For decades, the agencies in charge of protecting human health have used “lethal dose” (LD) estimates from studies in mice or rats to characterize the toxicity of a given substance or combination of substances. An LD of “1” (LD1) refers to the dose that would cause death in 1% of subjects (one in 100). A study conducted 40 years ago dramatically illustrated synergistic toxicity, showing that an LD1 dose of mercury administered together with a fraction (0.05%) of the LD1 dose of lead killed not 2% but 100% of the animals. A new experimental study in human brain cells establishes that co-exposure to mercury and aluminum indeed results in a significant synergism that is far worse than exposure to either substance on its own. The study, carried out by an international trio of researchers from the U.S., Canada and Russia, takes as its starting premise the fact that both mercury and aluminum are capable of provoking a pro-inflammatory response that is damaging to brain cell structure and function. Inflammation and immune system alterations are some of the earliest signs that a neurodegenerative process has been set into motion. To carry out their study, the researchers added aluminum sulfate and mercury sulfate reagents (at five different concentration levels) to human brain cell cultures, both singly and in combination, and incubated them for 24 hours. They then measured the extent to which aluminum exposure, mercury exposure or aluminum-plus-mercury exposure increased the amount of a pro-inflammatory marker called nuclear factor-kappa B (NF-κB)—a family of “transcription factors” (proteins) that help control gene expression and play a major role in immune and inflammatory responses, among many other cellular processes. (The researchers looked at a specific NF-κB complex called NF-κB p50/p65.) Studies have described abnormal regulation of NF-κB as a telltale feature of many neurodegenerative and chronic disorders. This observation deserves emphasis but is not entirely new. Back in 2005, Boyd Haley also reported on the effects on cultured neurons of both vaccine ingredients—thimerosal and aluminum hydroxide—alone and in combination, for two time periods (six hours and 24 hours). The new study’s use of NF-κB as a proxy for assessing the onset of pathophysiologic processes and inflammatory neurodegeneration represents a logical step toward greater understanding of the two metals’ synergistic neurotoxicity. Many other studies have highlighted the NF-κB signaling cascade “as the point of convergence of multiple pathways associated with the development of…neurodegenerative pathologies,” including Alzheimer’s disease, multiple sclerosis and amyotrophic lateral sclerosis (ALS). NF-κB signaling is also highly relevant for autism spectrum disorder; one study concluded that because “NF-κB is a response to stressors of several kinds and a master switch for many genes, autism may…arise at least in part from an NF-κB pathway gone awry.” Future research, according to the authors of the aluminum/mercury study, should study the effects of combined aluminum and mercury on other neurologically important molecules and also examine other combinations of prevalent neurotoxic metals. Implementation of rigorous vaccine safety measures represents an even more urgent challenge. As many observers have pointed out with regard to aluminum adjuvants, their presence in vaccines is not backed up by any suitable safety studies. Moreover, there is little evidence that anyone has studied the respective effects or potential synergy of the half a dozen distinct forms of aluminum adjuvant present in vaccines (see list below)—with as many as three different types included in a single vaccine such as Pediarix.